Walter is eighty-five, a man who loves the winter and the quiet peace of the night. He doesn't enjoy having to wake up. Yes, he has missed a lot in his life and all he wants is to quit everything. There is the "living room in the diminished evening light" that hides secrets that Walter carries in his heart, secrets that eat the life slowly out of him. Then a long time friend, Lillian, resurfaces and a new romance sets Walter on an exciting path. Can Walter conquer his fears and find redemption in a love that makes him feel so alive or will he allow the pain to destroy his new relationship? 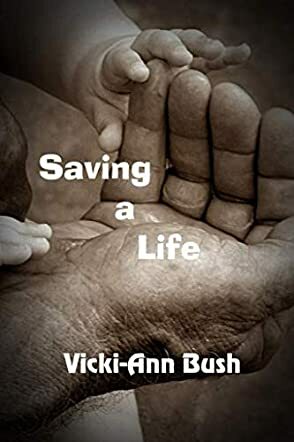 Saving A Life by Vicki-Ann Bush is an unusual romance with powerful hints of literary fiction. Vicki-Ann Bush takes readers slowly into the troubled soul of an old man, explores family dynamics, and gives them a delightful tale of romance. Character development is wonderful and I loved Walter the moment I met him in the story. It is interesting how he moves from apathy and his deep sense of loneliness into a loving, caring man. Readers encounter a man who just wants to be left alone, but love brings a new light and meaning into his life. The psychological conflict is well developed and readers will enjoy the complexities of the characters. Saving A Life is a novel with powerful lessons on love, tolerance, forgiveness, and second chances, a tale that is told in beautiful prose and in a voice that is compelling enough to keep anyone turning the pages. I enjoyed every bit of it.